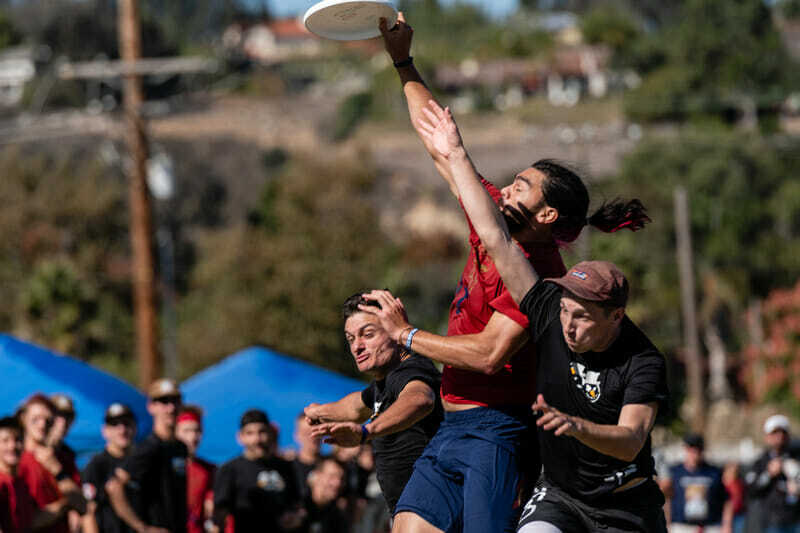 DEL MAR, CA—A wild PoNY comeback against Chicago Machine in the west headlined the Men’s Division quarterfinals rounds. As the Southern California day reached its warmest point, teams fought to stay alive in the championship bracket. Here’s the rundown of the men’s quarterfinal round. New York PoNY overcame a 7-3 deficit to beat Chicago Machine 13-11 in a well-played quarterfinal game this afternoon. Machine used their tried-and-true transition junk defensive looks to stifle PoNY in the early going, but the New York team engineered a late first half run of four straight points to charge back into the game. PoNY didn’t take their first lead until 12-11, with a throng of fans lining all but the field’s far end zone. Then, PoNY sent out a standard defensive line and broke to win after Mike Drost read an upline throw perfectly—nearly the same play that Ring of Fire’s Jack Williams made on double game point yesterday—to get the block and bookends for the winning score. “That was a fantastic play by Mike [Drost] and he’s been making them all year long,” said PoNY coach Bryan Jones. It was Machine’s Von Alanguilan who made the defensive highlights in the first half. After Jesse White secured the first break of the game, Alanguilan was deadly, applying poach-block pressure in space to fire up his teammates. Alanguilan a humble defender, was watching Ben Jagt carefully and waiting for his moments. “It’s always, ‘I can’t believe he threw it and now is my chance to pounce,” he said. Alanguilan’s heroics weren’t enough, unfortunately. PoNY shored up their offensive mistakes, solved the Machine defense, and held on to make a program-first appearance in semifinals. They’ll take on Seattle Sockeye for a chance to play in the Men’s Division Final. Don’t look now, but Seattle Sockeye are 5-0 and picking up steam as they barreled over Minneapolis Sub Zero en route to the semifinals. After a dismal Nationals in 2017, Seattle are clearly back amongst the best teams in the world. With the trickiest wind of the day dancing across the field, both teams pounded in downwind points to start. Sockeye opened the game up with a four throw sequence, ending with Dylan Freechild sending a backhand down the line to Matt Rehder for the score. Freechild and Rehder punished Sub Zero all game, alternating going deep and coming under, combining for three goals and goals assists. Sub Zero were able to hit nice touch throws downwind, but when they missed Sockeye defenders were there to take advantage. Billy Katz got a paw on a Cole Wallin backhand and bodied out his defender at the cone for bookends, making the score 5-3. Katz exerted his physicality en route to two blocks and two goals. 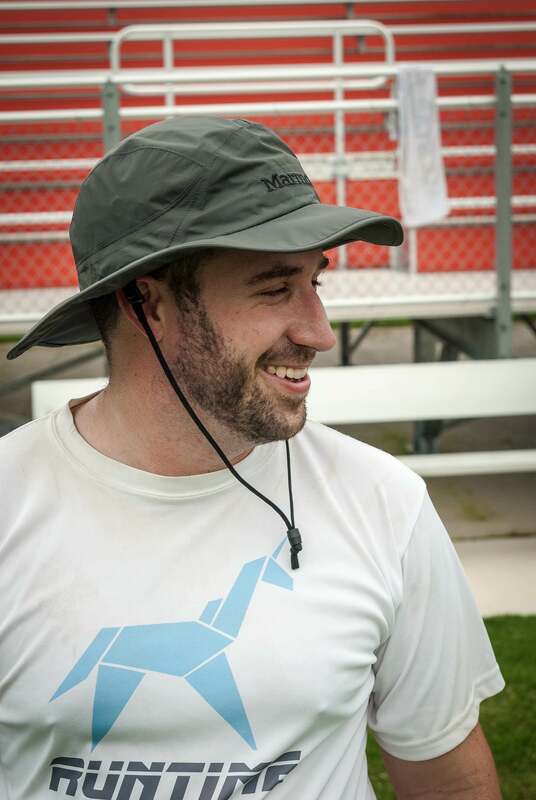 Sub Zero’s offense functioned well—Nick Simonelli in particular filled up the stat sheet—but they appeared to be a lesser version of what Sockeye were doing on the other side of the field. Each team was able to exploit the deep space, but Sockeye’s cutters were a little more open. Each team did a good job of attacking the shallow break space, but Sockeye’s throws were more in stride while Sub had to spend an extra second gathering. Sockeye took half 8-5 and both offenses cruised from there. It was rare for Seattle to need more than five or six throws per point to score. Freechild and Rehder kept pushing the pace for Sockeye, and eventually Sub’s offense couldn’t keep up. Seattle broke to win after a miscue from Ryan Osgar gave them a short field and Ben Snell dished to D.Y. Chen to cement the 15-10 win. It speaks to how well Sockeye is playing that they were able to win so comprehensively without breaking a sweat. Austin started the game with a bang, breaking Ring on the first point. Ring settled in on offense over the next couple points. Jack Williams continues to be the most explosive player on the Raleigh offense and Austin did not have much of an answer for him. Defensively, Ring started rolling out a variety of zone looks to frustrate Doublewide handlers Dalton Smith and Brandon Malacek. “One of the things that’s always been part of our identity is tenacity and trying to be relentless on defense,” said Jonathan Nethercutt. The game started to get a little chippy with players clearly upset with some of the calls from observers. Both teams received yellow and blue cards in the first half. Doublewide showed off its athleticism though, breaking through the zone with some tough downfield throws to tall and fast receivers. Larberg reeled in a tough grab bidding into the end zone. Jason Holleran brought down a towering huck a few points later for a break. But Raleigh maintained the edge, leading 8-6 at half. The wind picked up a little in the second half, which Nethercutt said dictated the force for Raleigh. Both teams found success converting break opportunities after halftime, but it was Austin who eventually clawed its way back to within one at 11-10. Then Ring found a different gear and closed out the game with three straight points. After a hold, Raleigh forced a turnover from Malacek and Sol Yanuck threw a tough inside-out backhand to Josh Hartzog for the goal. On the final point, Eric Taylor earned a full-extension layout block. Jacob Fairfax caught the next pass on the goal line and squeezed it to Noah Saul at the front cone for the game-winner. It was the best sequence of the game for Ring. Now, Ring faces Revolver in the semifinal for the third year in a row. Raleigh always seems to come up short against San Francisco. Ring knows the challenge a team like Revolver will bring. It will need to play like it did over the final three points against Doublewide even more frequently in order to reach the finals. On the other side, despite being eliminated from championship contention, Doublewide still feels it has a lot left to play for. Revolver faced their toughest test of the weekend so far but proved more than up to the challenge, scoring three points straight down the stretch against Washington D.C. Truck Stop. Truck Stop got a break opportunity after Simon Higgins overthrew a huck. Truck worked the disc to the break side and David Sheilds dialed up a huck to Rowan McDonnell. 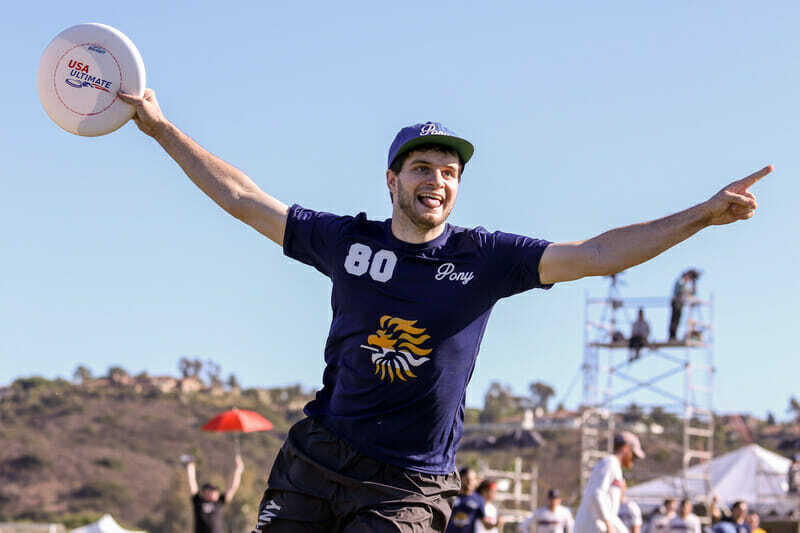 McDonnell has been Truck’s ace-in-the-hole all season and when he wasn’t able to come down with the disc over Higgins it was emblematic of Revolver’s ability to take away what teams want to do most. On the next point Truck tried to go deep to McDonnell again, but Nate Prior put too much edge on his backhand and once again McDonnell got out-bodied. Off the turn Revolver put in the first break of the game, and then a few points later the second. After a Lloyd Blake drop Greg Cohen pumped backhand and then put a flat flick into the inside deep space and Lior Givol elevated for an emphatic goal. Down 6-4, Truck refused to go away. Battling on every point their defense came within inches of several blocks, but couldn’t finish the play. To beat a team as good as Revolver you need to be lucky and good, but Truck’s luck just wasn’t there. 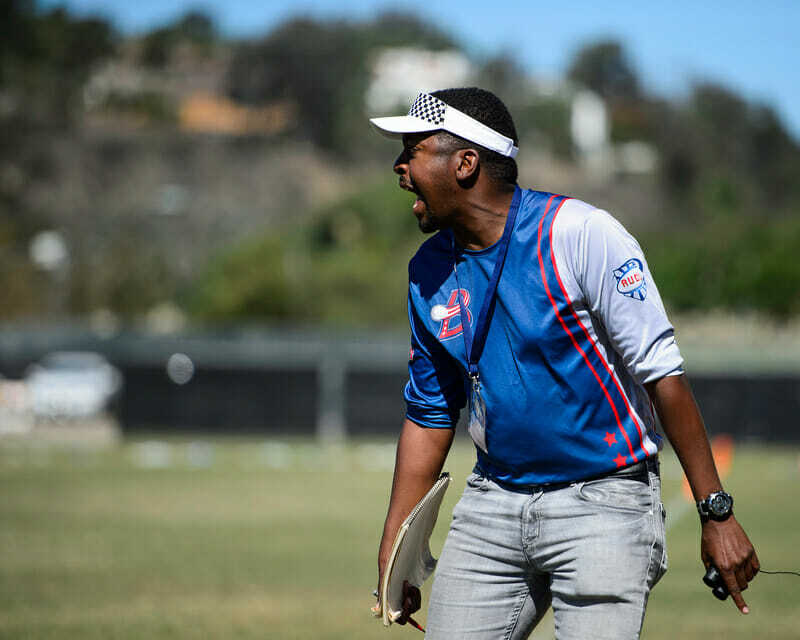 David Bloodgood perfectly read an upline cut and launched himself through the air, but his soaring bid just missed the disc and Revolver quickly punched in the hold for half. 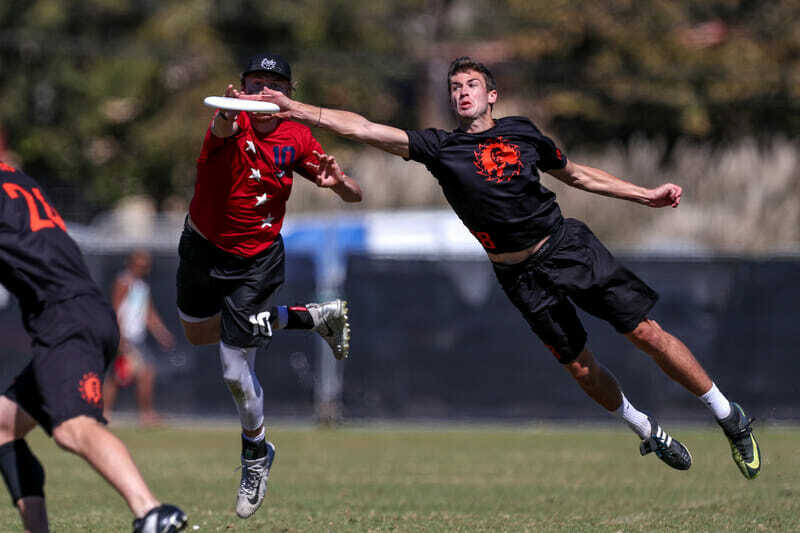 Revolver’s deep game was stifled in the the first half, but as Truck started to lose energy the San Fransisco receivers started to find more freedom in the deep space. Truck Stop broke to pull the score within one, but on the next point Marcelo Sanchez tore deep and laid out past a bidding Tyler Monroe by a hair, making one of the best catches of the weekend. Revolver was winning these battles by the smallest margins, but those margins loomed large on the score board. After Sanchez’s grab made in 13-11, Truck Stop’s offense ran out of gas and two more deep looks from Revolver put the game away. Revolver were pushed to the limit by Truck Stop, and still won by four which is an ominous figure for the rest of the division. Comments on "Club Championships 2018: Quarterfinals Roundup (Men’s)"